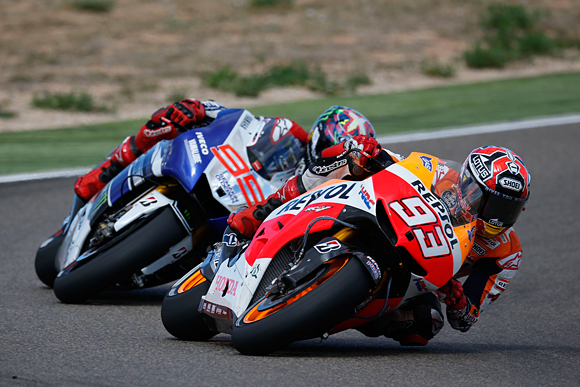 Points leader Marc Marquez (Honda) took yet another win today at the Aragón circuit ahead of defending champ Jorge Lorenzo (Yamaha) and third place finisher Valentino Rossi (Yamaha). Rossi inherited the final podium spot after Dani Pedrosa (Honda) crashed heavily following contact with teammate Marquez. Early reports indicate Pedrosa is not seriously injured, however. With just four races remaining, Marquez has a commanding 39 point lead over Jorge Lorenzo in the championship, while Pedrosa’s championship hopes are almost certainly over with today’s DNF, leaving him 59 points adrift of the leader. For additional details, results and points, visit the official MotoGP site. Dani is snakebit..always has been. When he gets close to winning it all, something bad happens Too bad. Great racer. Maybe it IS karma for knocking Hayden down, who knows? Marquez is a great racer…and lucky too. He’s run into more people than Pedrosa ever thought of (including knocking his own teammate out in the middle of a title chase), but when he does it he picks up spots. Lucky I tell you. please don’t say that. I cringe when I hear someone bringing that up in 2013. 7 years has passed now, nearly a decade this. SOOOO much has transpired since then. I know Norm but I don’t know how else to explain it. I mean why? The kid is good, he just can’t put it all together and I would hate to see that be his legacy. Racing is racing..I didn’t blame him then, and hold no grudges for it today ( unlike some people who will never forget/ forgive). Guys race, they run into each other, people get knocked down. It happens. There it is. The difference between an elite, talented rider and a champion. Guys like Schwantz, Doohan and others concur, as well. Tire-spinning exits make for much more entertaining racing for the fans, too. No one is suggesting any such thing. World Champion racers with extensive experience on the current bikes, such as Valentino Rossi, Casey Stoner and Nicky Hayden are, however, saying that they would love to see the expensive, frustrating electronics go away, particularly since only Honda and Yamaha seem able to/can afford to dial them in. Go ahead and level the playing field, basically. They also want to return MotoGp machinery to where not just anyone can ride the things like a god due to those electronic safety nets, which is somewhat the case now. Guys like Kevin Schwantz, Mick Doohan and many others agree, as well. Besides, fans love tire-spinning exits. I get what you’re saying, but remember that Bradl, Bautista, and Crutchlow are not on factory bikes. In my mind, it’s a testament to their skills that they are staying with Rossi on second-tier machines. I’d love to see what they could do if they had Rossi’s bike. same as what spies did and same as Edwards before him. you’ve already seen this movie. So you’re saying that guys like Crutchlow, regularly on the podium with an inferior bike this year, would be worse with a factory ride. That seems hard to believe. I agree that Spies didn’t exactly shine, or Colin Edwards for that matter, but I wouldn’t say those examples prove the point. I think Crutchlow will be worse on a factory Ducati ride! I think the point is, the 2nd factory Yamaha is developing a history of being well, 2nd. The Hondas have been closer in recent years with Dovi and Pedrosa. Marquez has been stellar. I would bet my bike that would not have happened if they hadn’t changed the rules to allow him onto the factory team in his 1st year and the same had he joined Yamaha. just go with it. yes, most stuff I say seems shocking at first, but the passage of time invariably proves me right. i’m hitting in the 94-96 percentile range. Sad to see Dani possibly loose another (maybe last?) chance! IF he goes out: with Stoner being a test rider, could he come in as a temp for Dani? Probably a long shot, but would love to see him scrap with MM. Having your traction control cable yanked off from behind without knowing it before getting hard on the gas of a 1000cc MotoGP bike has to feel well below average. I have to say, I’m with Casey Stoner, Nicky Hayden and Valentino Rossi on this one. Ditch all the rider-aid electronics. Let the guys twisting the throttles provide their own traction control, as God and Kevin Schwantz intended. Speaking of Rossi, while it’s rather sad to see that he’s not quite fast enough anymore to stay with the Three Tenors, it’s still very cool to watch him always find a way to out-racecraft everyone else whenever there’s a late-race scrap for the next best finishing position. The guy comes out on top of those things nearly every time. It must drive the Bradls, Bautistas and Crutchlows of the world absolutely batty. +1 on deleting the electronic nannies….let the riders ride and the tuners tune and the best team win. The riders are riding and the tuners are tuning and the results are the same. Deleting the electronics would certainly make it cheaper and maybe we’d see larger grids with more teams fielding competitive machinery but that’s a big step towards spec racing (which I’d welcome personally). see entry for ezpelata’s vision of WSBK. he’s not fast enough or the BIKE’S not fast enough…? NATCORK (No Amount of Talent Can Overcome Recalcitrant Kit). now ask yourself, how does this comment fit in the context of my previous statement…? does it align…? or contradict…? discuss (internally that is). Well, seeing as how he’s riding the same bike that Lorenzo is riding, and Lorenzo is consistently qualifying faster and finishing higher nearly every race, I’d have to say that it comes down to Rossi no longer being quite fast enough. He’s still plenty fast, obviously, since he’s often within a tenth or two of the top three guys, but he doesn’t seem able to replicate Lorenzo’s blazing fast qualifying runs, never mind Jorge’s jackrabbit starts. The fact that Rossi ends up with those other guys, running close with them the entire race only to nip them every time at the end, speaks to his superior racecraft. The other guys are basically just as fast as he is. He simply knows how to get it done, when it gets down to it. you sure about that…? grandprix bikes are nothing without support. hmmmn, so he’s not fast…? but yet, he’s got racecraft. interesting. Clearly Rossi remains enormously fast. Just as clearly, he’s nevertheless a tick slower than Lorenzo on the same bike (as far as we know, anyway, and Rossi has never given any indication to the contrary), and he’s also not quite as fast as the two guys on the Repsol Hondas. There really is no disputing this. Perhaps he will turn the tables next season, but in terms of this season it’s the only substantive conclusion one can make. See, I knew we’d agree on something. Removing the electronics (and spec tires, already got those) turned F1 around, I would very much like to see the same in MotoGP. Dani have another ‘mathematical chance at the title’?